Calcium chloride is one of the most effective de-icing agent in the industry. It is an economical and environmentally friendly form of liquid salt that is delivered at a 32% solution and then applied to surfaces and roadways that if left untreated can cause loss of traction and cause serious accidents. Rock salt alone takes time to embed in hard ice and packed snow, leaving surfaces vulnerable to loss of traction. When calcium chloride is added to rock salt at a 32% solution, it immediately digs in and begins to restore traction to the treated surface. Calcium chloride can be used in summer months as a dust control agent for unpaved roads and aggragate lots. Calcium Chloride is on of the most effective dust control agents in the industry. 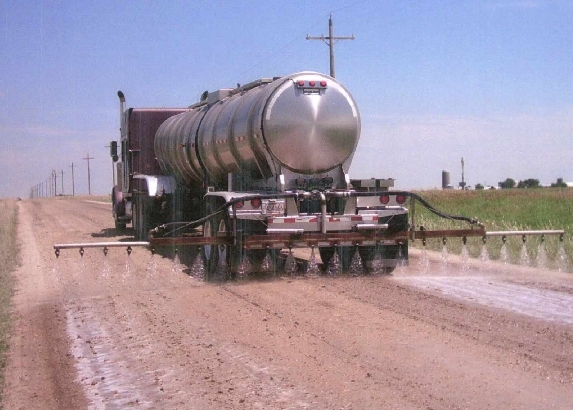 It is an economical and environmentally friendly form of liquid salt that is generally sprayed at a 35% solution onto unpaved roadways from a tank-trailer. Dust is a nuisance on unpaved roads and can affect visibility to such a degree that driving on untreated roads can become a hazard. An unpaved road that has been treated with calcium chloride will retain a smooth, dustless surface and requires less maintenance than roads treated by other materials. This dust control product maximizes road compaction which can reduce the cost of replacement aggregate by up to 80%. Calcium Chloride is the safe, smart, and environmentally friendly way to maintain your road. When Calcium Chloride enters a road, it is attracted to negatively charged soil particles. This establishes an optimal level of moisture density, thereby creating a longer lasting and smoother riding road while minimizing the hazards of reduced visibility due to dust. Calcium Chloride may move deeper into the soil base during wet weather but rises towards the surface during hot dry days, making it a long lasting and environmentally product.